In a letter to U.S. Secretary of State John Kerry dated November 2, Kristine Delkus, executive vice president, stakeholder relations and general counsel, says that TransCanada wants the pause is to allow time for the Nebraska Public Service Commission to complete its route approval process. Delkus explains in the letter that on October 5, TransCanada filed an application with the Nebraska Public Service Commission for approval of a third route proposal across the state for the Keystone XL pipeline. First proposed in 2010, the Keystone XL Pipeline would carry synthetic crude oil and a heavy substance known as diluted bitumen from the oil sands of Canada between Hardisty, Alberta, and Steele City, Nebraska, where it would enter another piipeline for transfer to refineries on the Gulf Coast. The Keystone XL pipeline would run through Baker, Montana, where American-produced Bakken light crude oil from the Williston Basin of Montana and North Dakota would be added. Because it must cross the Canada-U.S. border, Keystone XL requires a Presidential Permit asserting that it is in the U.S. national interest. In January 2012, President Barack Obama rejected the TransCanada application amid protests about the pipeline’s impact on Nebraska’s environmentally sensitive Sand Hills region, which overlies the Oglalla Aquifer, the water supply for much of the American Midwest. 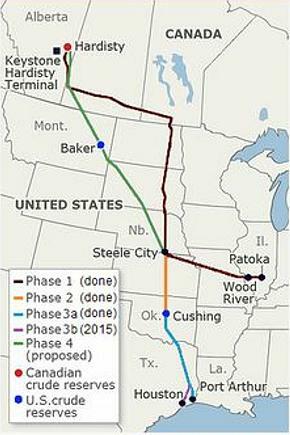 TransCanada changed the original proposed route of Keystone XL to minimize “disturbance of land, water resources and special areas.” The second route was approved by Nebraska Governor Dave Heineman in January 2013. On April 18, 2014 the Obama administration announced that the review of the controversial pipeline has been extended indefinitely, pending the result of a legal challenge to a Nebraska pipeline siting law that could change the route. TransCanada’s request to suspend its permit application came just hours after White House Press Secretary Josh Earnest said that President Obama intends to make a decision on the pipeline before the end of his administration. Environmentalists, who have fought the Keystone XL proposal for years in the courts and in the court of public opinion, are on the verge of declaring victory. They point out that the route across Nebraska has long been uncertain, it is obvious that this is simply a desperate attempt to run out the clock on Obama’s presidency in hopes that a Republican might be elected to the White House in 2016. “TransCanada sees the writing on the wall, and is trying to run out the clock in hopes that the next president will not weigh climate science in his or her decision about the dirty Keystone XL tar sands pipeline,” said Anthony Swift, Canada Project director at the Natural Resources Defense Council. Bill McKibben, founder of the nonprofit group 350.org, has organized protests against the pipeline in front of the White House and elsewhere for years. “In defeat, TransCanada is asking for extra time from the referees, and clearly hoping they’ll get a new head official after the election,” said McKibben. “It’s time for the current umpire, President Obama, to reject this project once and for all, and go to Paris as the first world leader to stop a major project because of its effect on the climate. 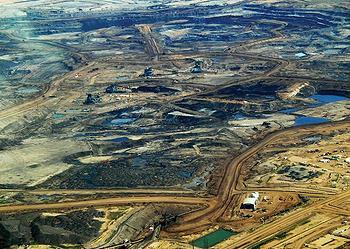 In the two weeks since Stephen Harper, an oil sands supporter, was voted out as Canadian Prime Minister, more than 100,000 activists have signed a CREDO Action petition urging President Obama to reject the Keystone XL pipeline. More than 97,000 people have signed the Keystone XL Pledge of Resistance, committing to risk arrest in peaceful, dignified civil disobedience, if President Obama’s administration moves toward approving the Keystone XL pipeline. As part of the Pledge of Resistance, thousands of activists have been trained to lead or participate in direct actions where they would risk arrest. 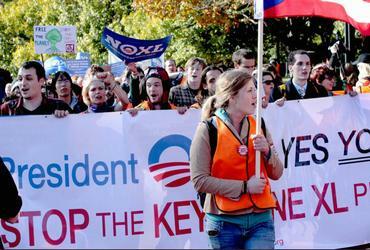 CREDO Activists have generated more than 4.3 million petition signatures in opposition to Keystone XL, and they have submitted 511,000 public comments to the State Department in opposition to Keystone XL.